Yep, those words came out of my mouth. Pra—travel junkie, adventurer, lover of life and opportunities—turned down an invite to Necker Island that had been extended to me by a dear friend. This was a place that had been on my bucket list of dream destinations since I can’t remember when. Looking back, it was not my proudest moment. Getting invited to Sir Richard Branson’s private island is like winning the lottery. It could happen…but only to a select few and certainly never you. Around 4 days later, I came to my senses and vowed NEVER to be so ridiculously sensible in my life again. I jumped online, pleaded insanity, and confirmed with my friend that of course I’d absolutely love to pack up and head over to Necker. Pra was on a mission and I quickly found a rather fab deal on Qatar Airways and began preparing my suitcase. Back in 1978, Sir Richard Branson was presented with an opportunity to buy an island and since he was trying to win over a girl, it seemed like the right move to make. After a savvy deal (and a bit of good timing), the asking price of $6 million was brought down to an offer of $180k and Branson found himself the owner of a beautiful piece of land. The one condition of the deal was that a resort needed to be built on the island within 4 years. This, of course, was (is) the stunning Necker Island. More often than not, the gut reaction to hearing about Necker is to exclaim that it’s nothing more than a billionaire’s playground. Without a doubt, it is exclusive and for the elite—even the most well-heeled of my friends who have been lucky enough to frequent the British Virgin Islands have only seen Necker Island from a distance. It seems so out of reach even though it’s right there, just across those crystalline blue waters. But, my goodness, when a miracle happens and you get to bury your feet into the soft, white sand that fringes the island and experience the “Necker Effect” for 4 nights? It dawns on you—this is a piece of luscious paradise that, despite the luxury price tag, is pure, beautiful, and full of surprises. Getting to Necker involved multiple flights and stopovers. I went from Dubai to Qatar to Miami to St. Thomas to Necker Island. That’s 3 flights, 2 hotel stays, and 1 boat ride. My first stopover was in Miami where I stayed at the Intercontinental Miami at the recommendation of Miami and Beaches. My room was fabulous and provided an even more epic sunrise experience overlooking downtown Miami. Although there’s another Intercon a bit closer to the airport, this one was still very central, plus it had the added bonus of having Chef Eric Do and Toro Toro Restaurant in the lobby. 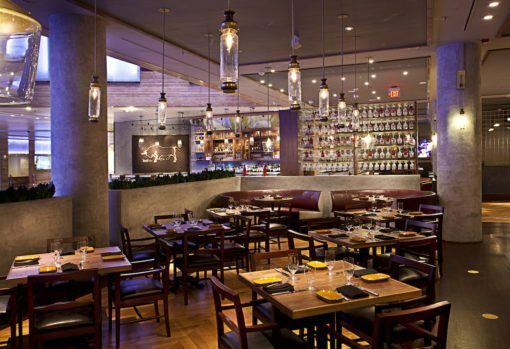 Between the service, the sunrise, and the spectacular food, the Intercon Miami was the best place to stay. I slept VERY well that night! My second stopover was in St. Thomas, where I arrived to the sounds of a steel band in the baggage arrival area. That’s when you know it’s time to chillax and embrace the island spirit! I parked myself at Mafolie Hotel, a gorgeous 22-room hotel that I found through BVI Tourism. 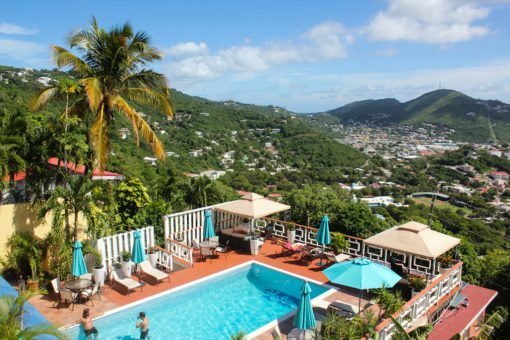 Popular but not mainstream, it’s for people who want to chill in true St. Thomas fashion, not those looking for the 5-star hotel vibe. Located up in the hills, stop by the bar and restaurant to drink in the most epic views. Grab a cocktail, settle in for the evening, and be lulled into a chill, island daze as you watch the sun sink over the ocean with its postcard-perfect smattering of yachts. Throughout the evening my friend Alan sent me a steady stream of Necker updates, giving me an idea of what I was in for come the next day! Fiery sunsets, lots of happy, familiar faces clinking glasses, paddle boarding…AND the boys in gigantic sumo suits!!! I was quickly getting the impression that Necker wasn’t an island for twiddling thumbs. The next morning, I jumped into a sleek speedboat that was waiting to take me and a few other friends to the island and zipped away from the docks of St. Thomas. Cutting through the stunning Caribbean waters, we passed super yachts and islands before being told that Necker was just ahead in the distance. The 74-acre island seemed to dance in front of my eyes with its vividly lush greenery and white sand beaches set against the brilliant azure of the sky and sea. We were greeted with flutes of champagne! An open, airy Balinese villa, the Great House has 10 bedrooms, including a fabulously grand 1,500 sq. ft. master suite and a rooftop terrace spacious enough to seat up to 40 people for a meal. 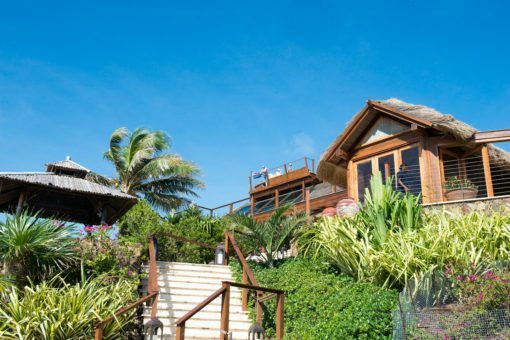 Scattered around the island are 8 private villas with names like “Love Temple” and “Bali Hi” which are equally luxurious and delectable (if not more so!). All aboard the tortoise train! My greeting party when I walked up to the villa was a family of tortoises and a Jurassic Park-esque iguana that seemed fairly unbothered by the new company. The tortoises made it very clear that this was their house and we were just visiting—they crawled where and when they pleased, including over my foot at breakfast the next morning, which resulted in a near-freakout before I realised what it was! Perhaps a game of chess with the iguana? My boudoir, like the rest of the house, was the embodiment of rustic luxury. I stepped out onto the balcony, which opened up to the most spectacular views of the island and left me slack-jawed and beyond appreciative of my luck that I was experiencing my own personal Utopia. Upon exploring my room a bit more, I discovered a handwritten note from the Virgin staff welcoming me to the island, along with all of the amenities I would need during my stay, from sunscreen to Aromatherapy Associates products. Had I known, I could have saved about 3 kgs of space in my suitcase! The large four poster bed was draped with voile and every night, I slept with the balcony doors wide open and the gauzy material gently blowing around me with the island breeze. The early mornings saw me out on the balcony, lounging on a massive sun bed as I watched the birds and listened to the sounds of this blissful paradise. It was like a scene right out of a movie. It’s time to put things into perspective about Necker Island. The staff are awesome, just like pretty much everything else Virgin touches. They know how to have tons of fun but they also deliver in spades and leave you wanting for nothing. 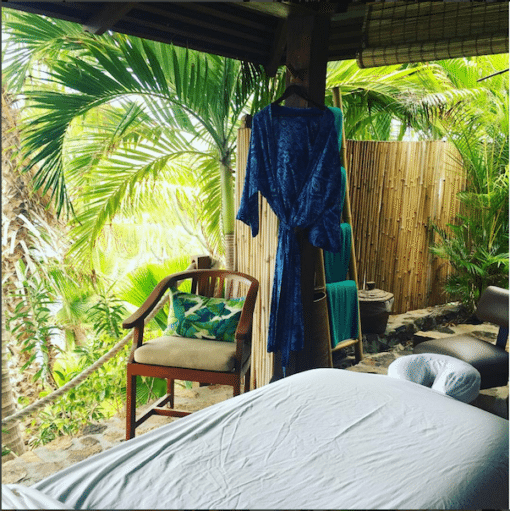 The outdoor spa – pure bliss! Not once did I get even an inkling of a “that’s not in my job description” attitude. I had the BEST masseuse I’ve ever experienced (shout out to Hazel Ball!) whose technique was gold medal-worthy. And yet, later that evening, there was Hazel serving up champagne. The staff here have multiple roles, from personal tour guides (like David who zipped me around the island and also stood in as my personal photographer!) 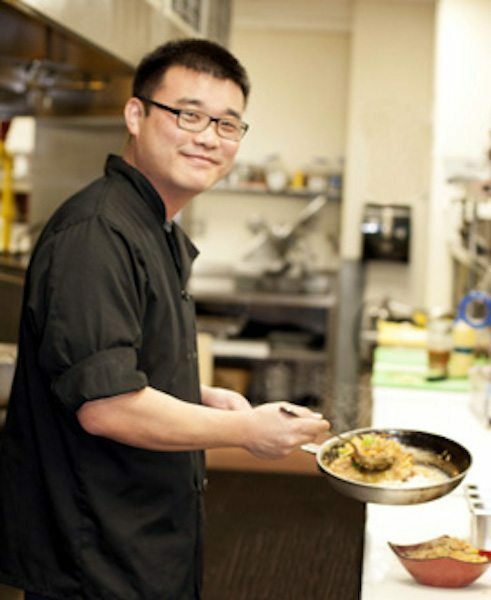 to sushi servers, sailing enthusiasts and tennis coaches, and they embody all of them with genuine enthusiasm. Going into recruitment geek mode for a minute, let me just say “WOWWWWWW”. These guys have really nailed being true Virginites. Name another island plonked in the middle of the ocean with the power to attract such top-notch staff. I’ve been in the recruitment game long enough to know that it’s damn hard. It would be easy for staff to get bored but because of things like Virgin Unite, it seems more like earning a Life Degree whilst on the job. 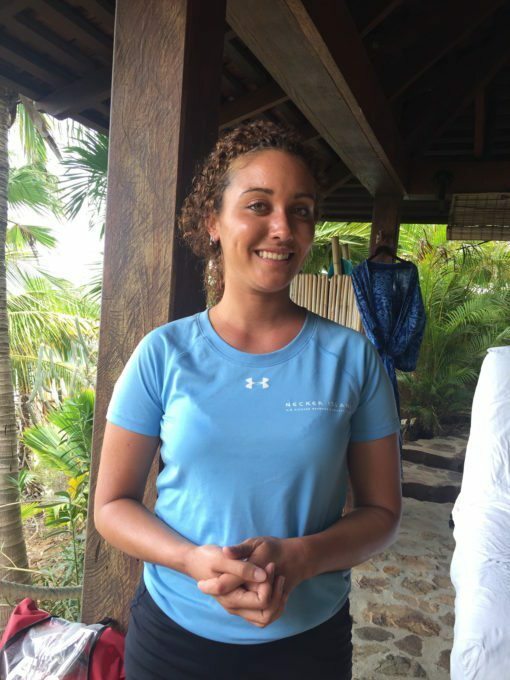 You can read more about the Necker team here. We were sad to leave but the Virgin staff gave us a fab send-off! You can do as you please and go where you’d like but in true Virgin fashion, the staff always have tricks up their sleeves to keep you entertained. Every evening, they prepared a theme for us and we were provided with all of the accoutrements to bring it to life. 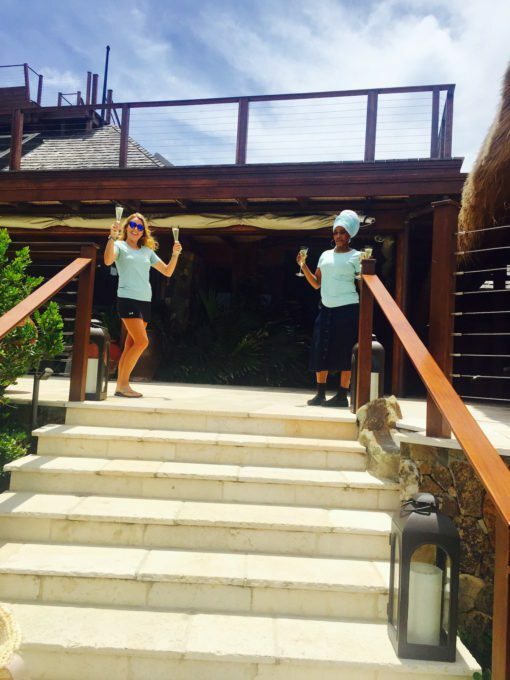 The Necker team says what happens here stays here. And why sleep when you can party? We were absolutely “neckered” after that night but it was worth every lost hour of sleep! And speaking of jacuzzis, the resident Necker dog is a big fan of them so be prepared for a furry companion if you’re soaking in one! On another afternoon, a group of us decided that we’d like to explore the BVIs, so staff member Seth took us to Cooper Island Beach Club, which was a stunner in its own right. One lunch and a few mojitos later, we zipped off on the boat to the infamous Soggy Dollar Bar—so called because you have to swim up to the beach—to imbibe in their signature Painkiller cocktail on Seth’s recommendation. Don’t ask me what was in them—all I know is they went down a storm. Even lunchtime came with a bit of whimsy and adventure. I found myself zip lining straight down to Turtle Beach from the Great House, looking particularly fetching in a ViX caftan, bikini, and Vuitton sunnies paired up with a lovely safety hat! Post-lunch on the beach, we swam out to a trampoline set in the ocean for an afternoon of bouncing around. 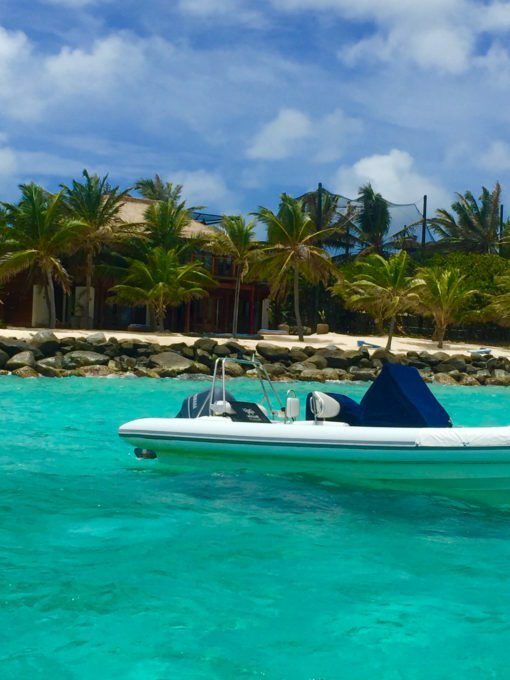 Other things that you can indulge in whilst on Necker? The floating sushi bar at Crocodile Pavilion (lounge in the pool and grab a bite of sushi as it floats by! ), practically every water sport you can imagine, or just lolling around on a hammock as you gaze out across the ocean…There is truly something for everyone and there’s no way you would ever be bored here! 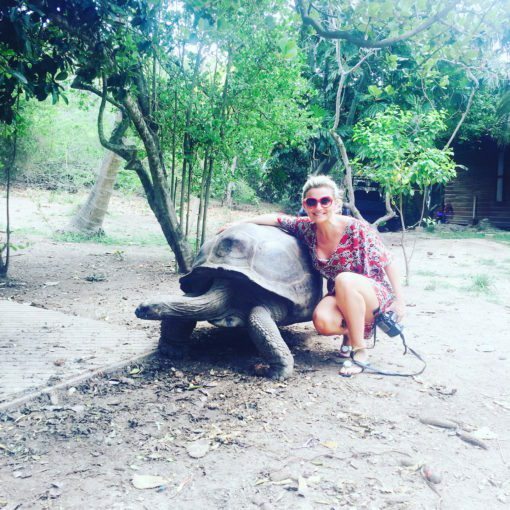 Necker Island is full of wildlife and the conservation efforts here are tremendous. Some of the creatures you’ll encounter are Aldabra Giant Tortoises, Scarlet and White Ibis, Rock iguanas (which can grow over 6 feet long! ), Anegada iguanas (which are already extinct in the wild), and flamingos. 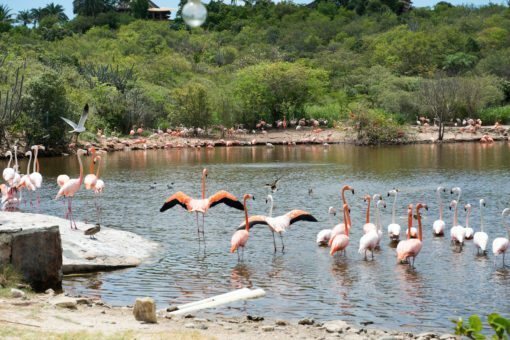 The flamingos were once native to the BVIs and are now part of a breeding programme on Necker Island to help repopulate the Caribbean. You can’t miss them—there are about 430 of these guys, including Miss Lucky who is blind! 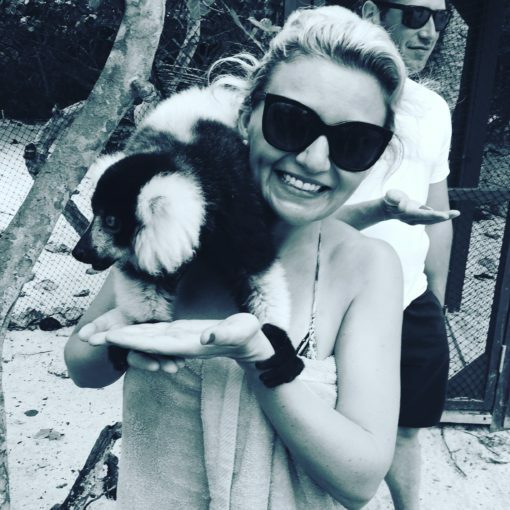 One of my favourite activities was feeding the endangered species of Madagascan lemurs, which Sir Richard Branson is passionate about trying to help preserve. There are currently about 80 of them from 7 different species (including Mongoose lemurs, Red Fronted Brown lemurs, White Fronted Brown lemurs, Red Collared Brown lemurs, and Black and White Ruffed lemurs). I went into one of the enclosures and no sooner had I grabbed some food were the friendly little creatures jumping on me to get a nibble. These little guys weren’t bashful in the slightest and it was just fab! And then there’s Virgin Unite, the entrepreneurial foundation of the Virgin Group. Several times a year, this foundation flies in some of the most inspirational speakers for the group’s Leadership Gatherings where people and entrepreneurial ideas unite to provoke positive changes in the world. 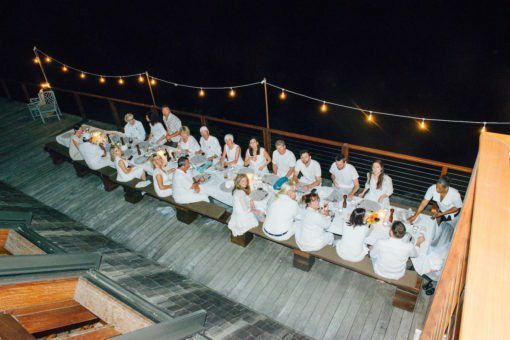 Some of the staff were saying how lucky they are to be able to lap up the words and wisdom of these speakers from around the globe whilst on Necker. Take, for example, recent speaker Cemal Ezel. He is a Virgin Start-Up entrepreneur who launched Change Please, “a social enterprise that finds exceptional homeless people and trains them to be baristas”. So I’d just like to remind those who have hinted at Necker being nothing more than a billionaire’s playground—perhaps it would be worth your time to go beyond the surface? Because although it certainly is a party island, there’s also a lot of good happening here! It’s amazing. You’re paying about 20x more than you would for a full-service, 5-star resort, and yet, you’re perfectly happy to go about your own business on Necker. No one’s tending the bar? No prob, just pour yourself a drink. Want to get from one side of the island to the other? Jump into an available buggy and drive yourself. There’s no expectation of being treated like Princess Grace of Monaco. The luxury is the ability to really make yourself at home and kick up your heels and enjoy the island experience, Branson-style. After 4 nights, I’m certain that my personal life mantra is right in line with the DNA of Necker. No great party started with a salad, water, or a laptop! And guess what…dreams can come true! Oh, and the girl he was trying to impress with the island? Dear reader, he married her.